Russia considers Pakistan as a natural ally but it has taken a long time to align with Russia. For the first time in history, Pakistan and Russia are coming closer by developing a strategic partnership, and extending cooperation to every sphere aimed at establishing people to people contacts. Once Pakistan was the ally of the United States, but now the regional situation has been changed as Islamabad has tilted towards Moscow. This new alignment came after Pakistan’s decision to boost full scale strategic partnership with its neighbor, and long-time friend China, by ignoring US warnings. Meanwhile on the world stage, China is the strategic partner of Russia. That is the main reason for Pakistan’s closeness with Russia. The history of South Asia has witnessed that America has tried to unite Pakistan and India to counter China, but Pakistan’s timely decision to leave the American camp has changed the whole geopolitical jigsaw in the region. India meanwhile has opted for a policy to counter China and confront Pakistan through an alignment with America and its Western allies. Russia - the strategic partner of China - came forward to South Asia to defuse America's dirty game against its partner China. Therefore Russia has accelerated its “Friendship-Druzhba” diplomacy towards South Asian rivals; India and Pakistan aim to resolve Indo-Pak disputes and repair the damages this region was subjected to by the west. While Western powers attempt to isolate Russia with NATO’s expansion in Eastern Europe, this provided an opportunity for Russia to establish strategic partnerships with Asian nations. Russia’s multipolar approach has engaged world nations for the betterment of a multipolar world through minimizing unipolar world hegemony. This Russian effort has focused on nations around the world for a global security mechanism, through bypassing the unipolar power. Moscow’s intimacy with Islamabad is also the part of Russia’s multipolar strategy towards South Asian nations, but unfortunately New Delhi felt resentful about this new approach of Russia, as it is historically the one of closest allies of Moscow. The fact is that India under the government of Prime Minister Narendra Modi appears as an ally of the USA as both countries have signed a military logistics pact. Modi’s shift towards the anti-China camp is the result of American corporate sector investment. Therefore, for the first time India has given-up the non-alignment principle of its foreign policy. While under Modi’s regime, the anti-Russian lobby funded by the US corporate defence sector came in power within the Indian establishment. This lobby has worked vigorously in India to prove that Russian defence technology as faulty by nature. Many believe that this lobby is behind the technological disasters in the Indian arms sector with the aim to replace Russian technology. The Indian defence deals with the USA and its western allies under Modi’s government are evidence of it, hence why Russia has lifted its arms embargo over Pakistan. Pakistan is considered a fragile state, and a struggle for power between politicians and military to run the country is making it weaker still. Corrupt politicians, continuous military coups, bad governance, a disastrous economy, and separatist movements are the main roots of its problems. History tells us that Pakistan from its birth to till date remained a vassal state and experimental laboratory of the unipolar world. The pentagon created the Jihad dogma which flourished here with the help of Saudi religious sermons. Illiteracy and the government’s lack of interest to educate youth provided an opportunity to extremist Muslims to fill the vacuum with Madrasas, by injecting radical form of Islam on the land of Sufism with the help of Saudi funding. Radical Islam with pentagon’s jihad was exported from these madrasas in Pakistan to Afghanistan, Chechnya, Bosnia, and Sudan and it was even brought to every corner of Muslim world with the assistance of Saudi Arabia, to protect geopolitical interests of western world in Muslim populated regions and countries from Caucasus Mountains to African Deserts. Before this Talibanization of Pakistan, the elected government of Pakistan’s anti-imperialist leader Zulfikar Ali Bhutto was toppled by army general Zia-ul-Haq with the help of the CIA. Zia who was known as the godfather of radical Islamic militants, and also given the title of butcher by Philistines because he killed thousands of innocent Philistines during the “Black September” operation in Jordan, became the President of Pakistan after hanging Bhutto to death and forcefully amending Pakistan’s liberal and secular constitution into one Islamic in nature. In fact, many believe that the creation of Pakistan was the main reason to prevent Soviet communism into South Asia, hence why division in the subcontinent was made by British rule as a scheme of Islamic crescent to prevent communism. While at that time the USSR's leader Marshal Stalin was aware of this western scheme therefore Stalin was the first leader who welcomed the birth of Pakistan through sending invitation letter to Pakistan’s leadership to visit Moscow. Stalin's intention was to align newly born Pakistan with the USSR as at that time only 20 KM narrow strip known as Wakhan Corridor separated Pakistan from the USSR's border (currently Tajikistan). This geopolitical approach of Stalin towards Pakistan was enough to put down the western great game in south Asia. American president Truman sent an invitation latter to India. But unfortunately, Pakistan’s first Prime Minister Laiquat Ali Khan was circled by CIA agents at that time, and waited for Washington invitation. Finally in 1950, Khan went to America through rejecting Stalin's request. Many scholars of Pakistan’s history blamed Khan, that he sold Pakistan to America. That was the beginning point of Pakistan’s alignment with America and cold rivalry with the USSR. Later in the 70'ss, Bhutto tried to change the fate of country by establishing contacts with the USSR. He visited Moscow in 1972 and brought Soviet investment to Pakistan. One of Asia’s biggest steel mills, Pakistan steel mill, was installed by the USSR as a token of friendship to the Pakistani people in 1974. But later in 1977, the CIA sponsored a military coup an turned the Afghan Jihad against the USSR ; it turned friendship into rivalry. Here it is also necessary to mention that during Bhutto regime, the Communist Party of Soviet Union (CPSU) had success in establishing its sphere influence on Pakistan’s left wing parties. At that time Bhutto’s own party, the Pakistan People Party (PPP) was much closer to the Soviet Communist Party. Bhutto, as a left-wing leader, introduced the ideology of Islamic socialism which gave space to the USSR intended to flourish socialism. During the decade of Zia’s Talibanization of Pakistan, the CPSU remained in contact with Pakistan’s socialist and left wing parties to counter radicalization of Islam till 1991. Fortunately, Pakistan had success in maintaining brotherhood with its neighbor China from the beginning. Pakistan was the first Muslim country who recognized modern China under communist rule in 1951. The credit of forever friendship again goes to Bhutto, who turned his personal friendship with the founder of modern China, Mao Tse Tung into Pak-China friendship. Even Pakistan played a mediator role between China and the USA, as a result American president Nixon visited China in 1972. China helped Pakistan with weapons during the Indo-Pak wars while China being the permanent member of UN Security Council, always supports Pakistan’s stance in the UN against its traditional rival India. China is the only country who helped Pakistan to bring it out from militancy and Talibanization. Army operation against militant groups was launched by Pakistan on the pressure of China. In other words, Pakistan took a U-turn by plugging out the support of terrorist organizations intended to clean and clear the Chinese trade route of the Silk Road, which provides the shortest land route to China and landlocked Central Asian states to reach the warm waters of the Arabian Sea. The China-Pakistan economic corridor (CPEC) under China’s One Belt One Road scheme turned Talibanization of Pakistan into Chinization of Pakistan, by giving new hopes for prosperity and regional development. China was well aware of American influence from state structure to the basic family unit, and Pakistan’s dual game with America cautioned Chinese leadership. Therefore China has taken preventative measures with strengthening state intuitions, the private sector and basic infrastructure of Pakistan. Beside this, under this Chinization concept, Chinese companies are also taking an interest in the privatization process of state institutions of Pakistan with the intention of minimizing western influence on Pakistan. Chinese strategic interest in Pakistan also attracted Russia and Central Asian countries which are strategic partners of China on the world stage to move toward Pakistan. Historically, India has a multipolar state structure as the fertile Indian soil has given birth to many religions, civilizations and cultures. The Indo-Gangetic plain has unique features of integration. Many ancient races integrated in this land between the Indus and Ganga rivers. But now in the present time, as regional integration has reached the door of India, it is acted as the bridge for the walk of unipolar hegemony over to multipolar India under the Modi-led Bharatiya Janata Party (BJP). In fact the BJP is the political wing of Hindu extremist ideological organization Rashtriya Swayamsevak Sangh (RSS) which was involved the anti-Sikh riots in 1984 and the 2002 Gujarat anti-Muslim riots. While Indian Prime Minister Narendra Modi is also a registered member of this extremist organization, as his previous record is witnessed that he had blood on his hands. Being the Chief Minister of Gujarat he allowed the killing of Muslims during the 2002 Gujarat Hindu-Muslim riots. In other words, Modi has become the godfather of the Hindu Taliban. As once Zia turned Pakistan into an Islamist extremist factory, now the same thing Modi is being done in India, by changing India's secular image to an extremist Hindu state. India before Modi’s government was an active leader of the Non-Aligned movement (NAM) and this was the main principle of Indian foreign policy, but now after joining the US camp, India has given up NAM as Modi has dropped out of attending the NAM summit in Venezuela. In fact the Indian first Prime Minister Jawaharlal Nehru joined the Non-Aligned Movement intended to keep Indian relations smoothly with both world superpowers; USSR and America. Nehru was one of the great Indian leaders who opposed the British bid to involve India in World War2 and he led a civil disobedience movement in the subcontinent against the British decision to put India into the war. Therefore during the cold war era, he became the leader of NAM by keeping India outside of both blocs. Although he visited the USA immediately after the independence of India, but he also maintained a friendly relationship with the USSR. India all weather rival Pakistan joined the Central Treaty Organization (CENTO) also known as Baghdad Pact, and the South East Asia Treaty Organization (SEATO) which were introduced by the USA to counter the influence of the USSR in Islamic Crescent (from Mideast to Pakistan) and South East Asia, turned the Indo-USSR friendship into a strategic partnership. Historically, India being the leader of NAM got benefits from both Cold War rivals, America and the USSR. India utilized American influence to keep Pakistan out from the Indo-Sino War in 1962. In fact, Pakistan's Army was trained and equipped by America to prevent the emergence of alternate power centers in the region. Hence why at that time Pakistan rejected Chinese request to join it against India. India balanced diplomacy between Moscow and Washington and had gained financial and military support from both power blocs. Besides being an ally, America invested only on Pakistan's army to prepare it for war against USSR. That was the main reason of India's dependence on Moscow; to build its army with the USSR's military capability. Later during the Afghan war, Pakistan's army with jihad’s proxies fought against the USSR, and then Jihad was also introduced against India. The Khalistan movement, to break India and Kashmir, with Jihad to liberate Kashmir from Indian occupation, were launched during the Afghan war on the Indian front. But after the break-up of the USSR, America turned to India with the aim of countering the world’s growing super power, China. The US realized that Pakistan will not go against China at any cost. That’s why it maximized its influence on India by minimizing Russian influence. When Pakistan officially handed over Balochistan’s strategic port of Gwadar to China, Washington turned its back from Islamabad by building anti-China alignment with India between South Asian nations. For this purpose, the Hindu extremist BJP was used to create hostility in the favor of America so that the unipolar geopolitical objective would be achieved in the region by India. America's long time investment in democratic India brought fruit in the shape of Modi’s BJP win in the general election. After taking oath, Modi has waged a double edge war domestically and regionally in south Asia. Now India's secular and liberal image is under threat by this Hindu nationalist ideology conceded by the current ruling regime, while regionally, India has adopted a counter China policy by confronting Pakistan. India has not only given up non-alignment policy by joining the unipolar club but it has also accelerated the bilateral mechanism after diplomatic failure on multilateral blocs and alliances against China and Pakistan. Unfortunately India has drawn a redline between friend and foe on the Sino-Pak partnership issue. India's redline on the Sino-Pak nexus has increased difficulties for Russia as being the architect of the multipolar world, it is still struggling to pull together both Asian giants, China and India, together for the betterment of the world. But unfortunately, India's Modi has given a clear cut choice to Russia during Vladimir Putin's current visit to India on the eve of the BRICS summit. Addressing the media with Putin, India's PM Modi used the Russian proverb by saying “One old friend is better than two new ones”. 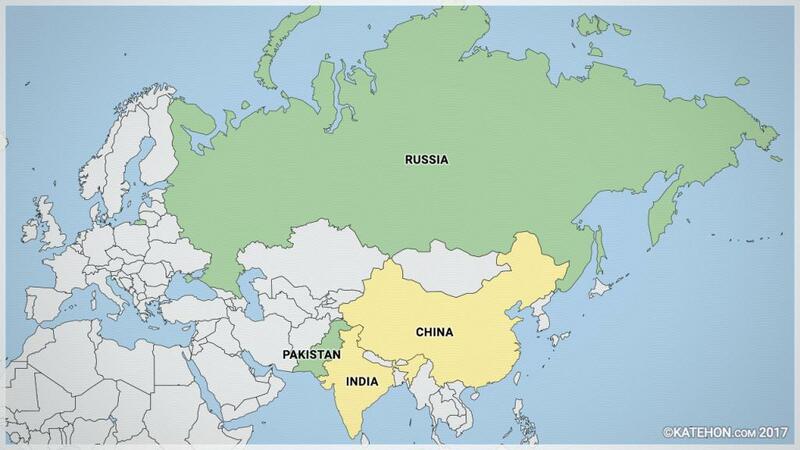 There was an indication for Russia that India as an old friend is better for Russia than China and Pakistan. But at the Indian hosted BRICS summit, President Putin and Chinese President Xi Jinping have also given a message to India by blocking Modi’s effort to isolate Pakistan on the terrorism issue. Recently, Russia has rejected all Indian concerns regarding Moscow’s emerging partnership with Pakistan. Russia has not only declined Indian plea about providing of Russian defence technology to Pakistan, but it is also going to strengthen defence ties with Pakistan, as both armies have started bilateral military drills from last year onward to an annual basis. Moreover, Russia has also rebuffed Indian attempts to isolate Pakistan regionally and globally by bringing it into line of the multipolar world. As it is utilizing Pakistan’s potential to eliminate terrorism which was introduced by US/NATO in the form of the Islamic State in the region, especially in Afghanistan at the same time Islamabad is also assisting Moscow in the Muslim world to overcome and defeat the extremist Islamic wave and ideology. Even for this purpose Russia has accepted the Taliban as a stake holder of the Afghan peace process. In other words Russia has accepted the Taliban as Pakistan’s dowry for a peace initiative. After the dissolution of the USSR in 1991, Pakistan kept its contacts with the new entity called Commonwealth of Independent States (CIS) but it came closer with Putin’s Russia, during the previous government of Pakistan’s people party (PPP), which came to power after the assassination of Bhutto’s daughter Benazir Bhutto. The co-chairman of the PP and the former President of Pakistan Asif Ali Zardari, offered Russia access to the warm waters of the Arabian Sea via Baloch’s Gwadar port during a visit to Moscow in 2011. The Shanghai cooperation Organization (SCO) also played a vital role in bringing Pakistan and Russia closer to each other. Russia publically supported Islamabad’s bid of joining the SCO as a full member. Russian president Vladimir Putin indicated he wanted to resolve Pakistan’s energy crises by offering technical assistance for Gaddu and Muzaffargarh power plants. Moreover Russian companies are going to construct the North-South gas pipeline from Karachi to Lahore with worth $2 billion. Although Russia is interested in connecting Pakistan and India with energy pipelines aimed to export Caspian Sea energy to South Asia, the current Indian anti-Pakistan rhetoric has become a hurdle for the expansion of the Caspian Sea energy to India, as India has dream to connect itself with Eurasian energy pipelines, but for this purpose it is again dependent on its rival, Pakistan, as its transit trade routes provide India the shortest land access to reach Moscow via Kabul and Tehran. Russia is seeking an opportunity along with the CPEC in the region to build the Eurasian energy grid in Pakistan so that Caspian Sea energy would be exported by utilizing the potential of Gwadar port (currently handed over to China), which considers a two-way export for East, West, south and North. This energy corridor would turn Pakistan into India’s irreplaceable energy partner, as the Caspian Sea’s proposed inter-continental gas pipelines would pass through Pakistan to South Asia via India. Unfortunately, India's strategic tilt towards imperial power centers of the unipolar world rang the alarm bells in Moscow. Modi’s adventures in wonderland persuaded Russia to keep a strategic balance in the region; Russia welcomed Pakistan as a new friend. But it does not mean that Russia has turned back from India. The Kremlin has also accelerated its efforts to maximize engagement with India so that the multiploarity of India would be saved for the larger interest of South Asia. To counter the American scheme, Russia has already boosted the bilateral and multilateral mechanism with all South Asian nations. Russian advocacy to bring all south Asian nations into the Shanghai Cooperation Organization (SCO) is seen in that Russia aims to repair south Asia with positive regional integration. Besides this, Russian potential to mediate between traditional rivals; India and the Sino-Pak nexus, is only hope for betterment of the region. But India's redline over Sino-Pak strategic partnership is worsening the situation and it provided a chance for Pakistan to replace India for Russia, while it has also convinced Russia to prefer two new friends over an old one, which has turned its back by joining the anti-regional unipolar camp. So the emerging axis between Moscow, Islamabad and Beijing is seen, and Russia has chosen China and Pakistan over Modi’s India with this hope that being the part of the multipolar world and BRICS/SCO institutions, India will return to regionalism as Pakistan – once ally of the US - becomes a new friend of Russia.